In the 18th century, tea caddies were used to store loose tea. Silver flasks for powders and perfumes were originally used to hold the tea. Over time, the ladies of the house preferred to spoon out the proper amount of tea rather than pour the loose tea. 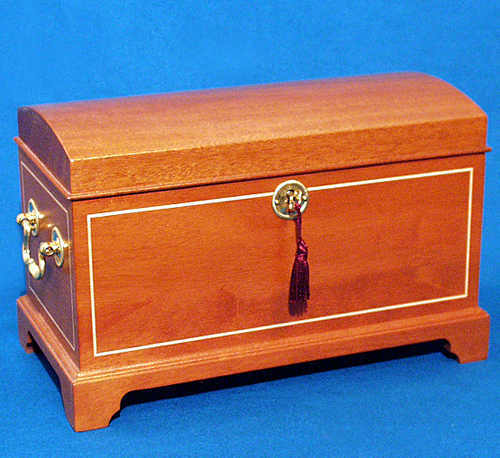 With the addition of wooden tea caddy chests the loose tea could be stored and spooned out easily. Most of the tea caddies were made of mahogany. The addition of inlays made them more decorative and unique. The interior of the tea caddies varied. Often double tea caddies had two compartments with two lids to store two types of tea, while some single tea caddies had only one compartment with one lid and an area to hold a sugar or mixing bowl. For more information on tea caddies see the Bombay, Apple and Pear Tea Caddies. Measurements in inches: height 7 ¼" × width 11 1/2" × depth 6"
This handfinished 18th century reproduction Federal style tea caddy is accented with Maple string inlay. The wooden tea caddy has a dome lid, heavy solid brass stop hinges, a brass key escutcheon, working brass lock and a brass bail handle with 2 rosettes on each end. This period furniture accessory can be used to store tea or other valuable items. A superb accent to our Chippendale Carved Tea Table, Queen Anne Tilt-Top Tea Table and Federal Sideboard/Huntboard. The Tea Caddy is offered with three additional options: a velvet, single or double tea caddy liner. With the addition of the velvet liner, this tea caddy may be used as a jewelry chest. Side detail. Click to view Photos! Federal Tea Caddy with Velvet Liner Price additional. Made in USA. . . . Please see our antiques for more interesting items.